More than $1 million of e-commerce revenue is generated every 30 seconds, as millions of consumers purchase billions of products online. And these days, shopping is getting social. People aren’t just engaging on social media sites, but buying through them, too. As constant changes to mobile technology and e-commerce tools continue to reshape how consumers interact with brands and retailers, social commerce is here to stay. 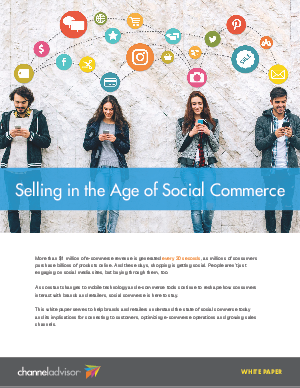 This white paper serves to help brands and retailers understand the state of social commerce today and its implications for connecting to customers, optimizing e-commerce operations and growing sales channels.